Did you already earn the badge or did your badge progress reset? If so, please check your badge album or Profile’s Badges tab first. The information displayed on the Home Page may differ from your actual badge progress. Make 30 Super Pops with Blue balloons this week! Super Pops are made up of 6 or more balloons. Aim for the blue ones this week! Use the various power-ups that come with each costume to set up Super Pops! Win the game by dropping all the prizes. Finish (win or lose) the game to see progress on the badge. Match 15 pairs of Star tiles this week! Match tiles by connecting them with a line that has no more than two turns. 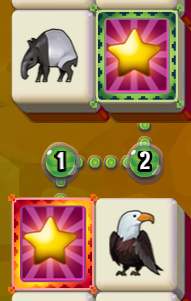 Star tiles provide power-ups so match them as fast as you can for help with clearing the board. Other special tiles will appear on the board – they can give additional bonuses! You can play on any difficulty: EASY, NORMAL or HARD. Earn 1050 tickets from Daubs and Bingos this week! Each Bingo called rewards tickets at the end of the game. Popping Reward Balloons has a chance to give tickets as well. Use the Cactus Cannon at the end of the match to pop even more balloon and call Bingos. Play with maximum number of cards for a higher chance of multiple Bingos. If you missed some numbers, you can check by clicking on the Bingo Ball icon.